Let's stop for a minute and spare a thought for runners' other halves. We find out - in a no-holds-barred interview - what it's like to live with a runner. 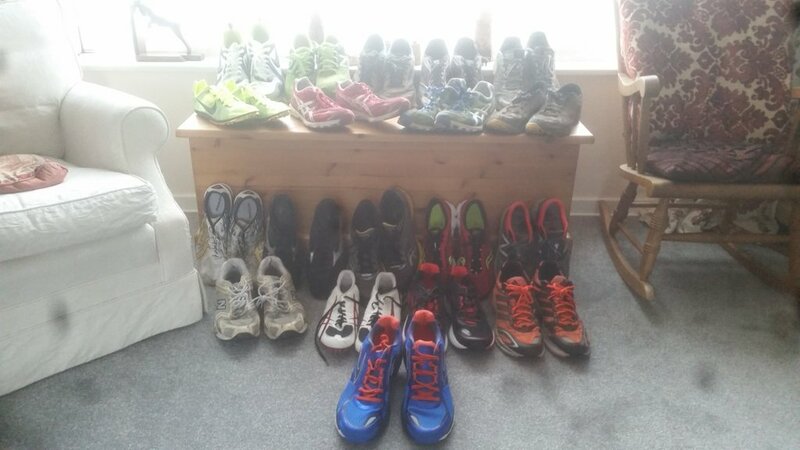 We discuss training, races, laundry bins and the need for 19 pairs of shoes. In order to avoid divorce proceedings, the interviewee wishes to remain anonymous. rb: Important first question then, did you know what you were letting yourself in for when you got married? rw: Nope, not at all. We met and fell in love drinking, smoking and eating in fine restaurants, no exercise at all really. No, he didn't start running until after we got married. We both decided to give up smoking you see, and he decided to take up running to help motivate himself. It really helped him, not just give up smoking, but losing weight, getting healthy, the whole thing. rb: So it was good that he started running? rw: I didn't say that! I was happy for him at first. But then it started taking over his life, and I started joking that he'd completely changed after we got married, and he'd tricked me! That it was false advertising! rb: Do you try and take an interest in his running though? rw: I do try, and in fact I was genuinely interested at the beginning, but after he'd explained VO2 Max to me the 30th time it started to get a little bit tedious. It's not just that though. You see, my husband runs pretty much every day. Often twice a day. And here's the thing, if I don't ask him after every run how his run was he gets upset with me. So, I started asking him every time – and he doesn't know this, although I suppose he will when this goes out – I kept a secret record of his responses. Do you want to know the most-common response? That's the only response he ever gives. rb: Oh dear! So aside from pointless repetitive responses, is there anything else that really bugs you? rw: Laughing I could probably rack my brains and think of a couple! Let's start with clothes. 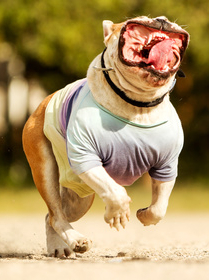 You need to wear the right clothes for running, I understand that. But why do those clothes need to be hung over doorways after a run? I even organised a special running laundry bin. But doors? The stuff's always hanging on doors. It's not like he leaves other stuff lying around. He is actually a tidier person than me, but when it comes to running clothes he's like a teenager. And don't get me started on the shoes! rw: Yes, I mean how many does one runner need? He's got trail shoes, road shoes, track shoes, cross-country spikes, snow shows – and for most types he's got ones that are worn in, a bit worn in, just for racing - I mean this is a joke right? A trick played on the poor runners by the clothing industry? I mean my Mum has fewer shoes then he does! They take up soooo much space. We now have three different shoe racks, but they're still scattered all over the house! I found one solitary shoe on the bedside table the other day. I nearly chucked it out of the window! rb: What do friends and family think of his new hobby? I mean, really! It's amazing we still get invited anywhere. Although even if we do, he's already got a race booked, so we can't go. rb: Do you enjoy watching him race? rw: Yes, I do. Races have a great atmosphere and it's great to support him and his team mates and it's great seeing the runner's high first-hand. rb: There we go! A positive aspect of living with a runner. rw: Hold your horses. I enjoy the actual race, but before and after is a different story! rb: Go on, give us details! rw: It starts the night before when I start getting blamed for hiding the Garmin, hiding the heart rate monitor, hiding the safety pins, hiding the race number. And of course, you can't miss the race, so apparently 17 different alarms are necessary. Irritable doesn't even begin to describe the mood on the actual day. We have an agreement that on race day all irritability is forgiven! For the sake of the kids, you know? Yes, leaving in time I understand. But leaving 2.5 hours before a race that's 12 miles away and takes 25 minutes to drive to is... insane. I don't point out that – despite being no expert – two hours might be a little long to spend warming up for a race that's going to take about 40 minutes to run. So we drive, and it turns out all runners are this insane and have also got there early, so it's actually a bit of a challenge to find a parking spot. And we want to find a good parking spot, because if it's raining I will probably spend the next two hours in the car while he warms up. Then about 20 minutes before the race is due to start I start getting nagged to get over to the start line. Now, I haven't been training for this event for 3 months, but I think I can manage to walk 200 metres in less than 20 minutes. Still, I dutifully get out of the car and walk over in the freezing cold and drizzle to watch him and 400 other lycra-clad lunatics wiggle around on the spot for 15 minutes. “So, how many laps is this race then?” I ask. “Oh, just the one,” he replies. And I instantly realise I've made the mistake of not memorising his 10k PB, analysing the course conditions, terrain and elevation and poring over his recent training logs so I could figure it out myself. Anyway, the race starts and off they go, and I hang around in the freezing cold for 30 minutes, then spend the next ten holding the camera phone up because the official photos are “a rip off” and I can't remember when exactly the race started. Just that it started late, like every other race ever! So I'm not sure when he'll come through. And finally there he comes. He's pulling this stupid face. That race all runners pull when they're finishing a race. An ugly contorted mess of a face. This. The man I married looks like a bulldog chewing a wasp while being beaten with red-hot irons. And I know it's down to me to suddenly become a professional photographer-slash-magician and somehow get the perfect shot that makes this idiotic face look like a male model and that illustrates his running form in a way that makes Mo Farah look like a hobby jogger. I feel like I'm moaning a lot, so let's say it's one of those days where he gets a PB and everything's great. I show him the photos and what do I get in response? rb: Wow! So, the race is all over and the rest of the day is marital bliss at least? rw: Laughs for a long time Well, everybody's in a good mood, sure. But now I have to look forward to an hour and 15 minutes of him standing around speaking to what seems like every single runner in the race. Sometimes he doesn't even acknowledge me waiting patiently at the finish line. He walks straight past me without even a glance and starts chatting to someone else. Not even a wave hello! When I eventually go over to him to hand him the water he said he'd be so desperate for, he says, “Oh, thanks love,” without even looking at me and continues talking. No introductions. Nothing. And I'm left standing there like a lemon! Then after the obligatory cool down, which seems to take another 40 minutes, everyone goes to the pub. rb: Well, that must be nice. rw: Yes, it's great spending two hours listening to every single runner go over every single split and every single race they have planned and every single training strategy for the 15th time. And none of this is actually said to me. They don't know what to do with me because they found out I'm not a runner. It's flummoxed them so much they can't think of anything to say to somebody that doesn't involve running. I feel like a mum at her son's 17th birthday party. Again with the lemon! Then on the drive home he's all excited to tell me everything that's happened. rb: Aaah – well that's sweet isn't it? rw: Except that I was there, and I've already heard all of it 15 times when he's discussed it with everyone else! Oh, then we get to pick the next race. rb: Races are definitely a struggle then. What about normal training days? rw: Well, aside from having to ask how the run was and the clothes everywhere, there is one thing that drives me mad: the amount of food he can eat! “Oh, I've done an 18-miler so I can eat sixteen thousand calories and I'm still in deficit, blah, blah, blah,” he says shoving another sausage into his runner's face as I look on eating my lone lettuce leaf. rb: Is it really all that bad? What can partners of runners do about all this? rw: Well, if you can't beat 'em - and I most certainly cannot - join 'em! rb: Oh wow, and how's that going? rw: I can't believe I'm admitting this, but I love it! Didn't at first, but after about 3 months, I well and truly got the bug and I'm an absolute convert! And I get to join in with the discussions at the pub now! rb: Well, if you're a runner you can answer our final question that we ask everybody: If you could beat any athlete from any era in any race. Who, when, where, what would it be? rw: That's actually easy to answer. I would beat my husband off no training at all. That'd wipe the smug look off his face. rb: Your wish is granted.. That'll teach him. You can keep up with the runner's wife on Twitter. She decided to create the account in response to this interview! Should you do that session? How can you run hills faster? Ask our team of experts and browse previous questions.